Four photographic filters. Clockwise, from top-left, an infrared hot mirror filter, a polarising filter , and a UV filter . The larger filter is a polariser for Cokin-style filter mounts . In photography and videography , a filter is a camera accessory consisting of an optical filter that can be inserted into the optical path. The filter can be of a square or oblong shape and mounted in a holder accessory, or, more commonly, a glass or plastic disk in a metal or plastic ring frame, which can be screwed into the front of or clipped onto the camera lens . Filters modify the images recorded. Sometimes they are used to make only subtle changes to images; other times the image would simply not be possible without them. In monochrome photography coloured filters affect the relative brightness of different colours; red lipstick may be rendered as anything from almost white to almost black with different filters. Others change the colour balance of images, so that photographs under incandescent lighting show colours as they are perceived, rather than with a reddish tinge. There are filters that distort the image in a desired way, diffusing an otherwise sharp image, adding a starry effect, etc. 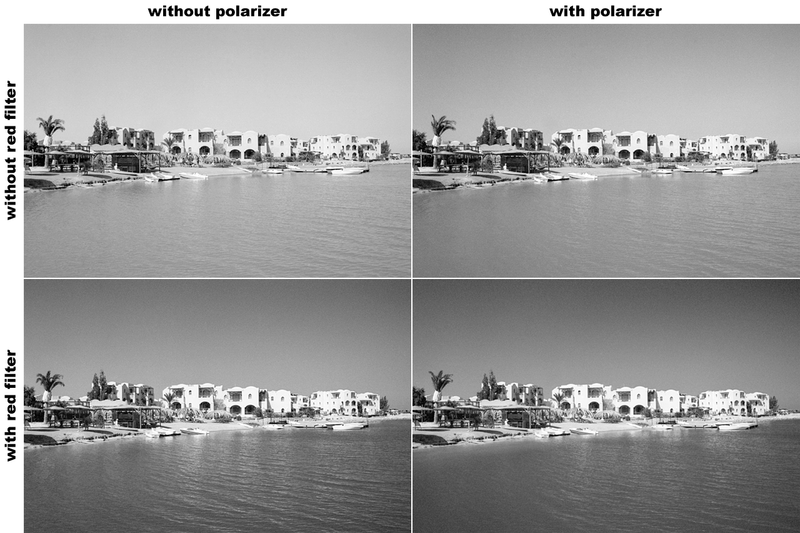 Linear and circular polarising filters reduce oblique reflections from non-metallic surfaces. Many filters absorb part of the light available, necessitating longer exposure . As the filter is in the optical path, any imperfections—non-flat or non-parallel surfaces, reflections (minimised by optical coating), scratches, dirt—affect the image. There is no universal standard naming system for filters. The Wratten numbers adopted in the early twentieth century by Kodak , then a dominant force in film photography, are used by several manufacturers. Colour correction filters are often identified by a code of the form CC50Y—CC for colour correction, 50 for the strength of the filter, Y for yellow. Optical filters are used in various areas of science, including in particular astronomy ; they are essentially the same as photographic filters, but in practice often need far more accurately controlled optical properties and precisely defined transmission curves than filters exclusively for photographic use. Photographic filters sell in larger quantities at correspondingly lower prices than many laboratory filters. The article on optical filters has material relevant to photographic filters. Clear filters , also known as window glass filters or optical flats, are transparent and (ideally) perform no filtering of incoming light. The only use of a clear filter is to protect the front of a lens. UV filters are used to block invisible ultraviolet light, to which most photographic sensors and film are at least slightly sensitive. The UV is typically recorded as if it were blue light, so this non-human UV sensitivity can result in an unwanted exaggeration of the bluish tint of atmospheric haze or, even more unnaturally, of subjects in open shade lit by the ultraviolet-rich sky. Normally, the glass or plastic of a camera lens is practically opaque to short-wavelength UV, but transparent to long-wavelength (near-visible) UV. A UV filter passes all or nearly all of the visible spectrum but blocks virtually all ultraviolet radiation. (Most spectral manipulation filters are named for the radiation they pass; green and infrared filters pass their named colors, but a UV filter blocks UV.) It can be left on the lens for nearly all shots: UV filters are often used mainly for lens protection in the same way as clear filters. A strong UV filter, such as a Haze-2A or UV17, cuts off some visible light in the violet part of the spectrum, and has a pale yellow color; these strong filters are more effective at cutting haze,  and can reduce purple fringing in digital cameras . Strong UV filters are also sometimes used for warming color photos taken in shade with daylight-type film. If there is blowing sand the filter will protect the front of the lens from abrasion and nicks. Adding another element may degrade image quality if its surfaces are less than perfectly flat and parallel. Filters from reputable makers are very unlikely to cause any problems, but some "bargain" products are optically inferior. Low-quality filters may cause problems with autofocus. 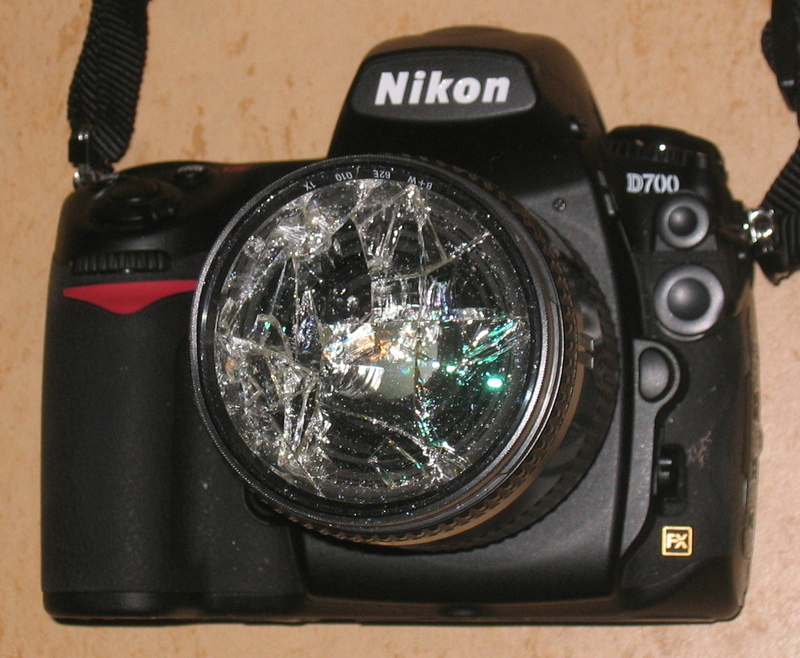 A filter may be incompatible with the use of a lens hood , since not all filters have the required threading for a screw-in hood or will allow a clip-on hood to be attached. Adding a lens hood on top of one or more filters may space the hood away from the lens enough to cause some vignetting . Appropriate color conversion filters are used to compensate for the effects of lighting not balanced for the film stock's rated color temperature (usually 3200 K for professional tungstens and 5500 K for daylight): e.g., the 80A blue filter used with film for daylight use corrects the perceived orange/reddish cast of incandescent photographic photoflood lighting (for which the usual photographic term is " tungsten lighting "), and significantly improves the stronger cast produced by lower-temperature household incandescent lighting , while the 85B will correct the bluish cast of daylight photographs on tungsten film . Color correction filters are identified by non-standardised numbers which vary from manufacturer to manufacturer. The need for these filters has been greatly reduced by the widespread adoption of digital photography, since color balance may be corrected with camera settings as the image is captured, or by software manipulation afterwards. 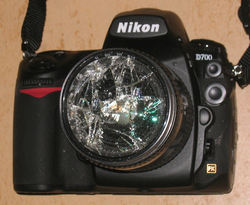 An extreme case: a Nikon D700 with a smashed filter which may have saved the Nikkor lens beneath. Usually, all that can reasonably be expected is protection from scratches, nicks and airborne contaminants. Color conversion filters (LB filters) must be distinguished from color correction filters (CC filters), which filter out a particular color cast f.e. caused by Schwarzschild effect etc. Color subtraction filters work by absorbing certain colors of light, letting the remaining colors through. They can be used to demonstrate the primary colors that make up an image. They are perhaps most frequently used in the printing industry for color separations , and again, use has diminished as digital solutions have become more advanced and abundant. 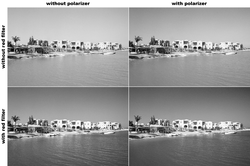 Colored filters are commonly used in black and white photography to alter the effect of different colors in the scene, changing contrast recorded in black and white of the different colours. For example, a yellow or, more dramatically, orange or red, filter will enhance the contrast between clouds and sky by darkening the blue sky. A deep green filter will also darken the sky, and additionally lighten green foliage, making it stand out against the sky. A blue filter mimics the effect of older orthochromatic film, or even older film sensitive only to blue light, rendering blue as light and red and green as dark, showing blue skies as overcast with no contrast between sky and clouds, darkening blond hair, making blue eyes nearly white and red lips nearly black. reduce contrast in addition to softening resolution. A polarizing filter , used for both color and black-and-white photography , is colourless and does not affect colour balance, but filters out light with a particular direction of polarisation . This reduces oblique reflections from non-metallic surfaces, can darken the sky in colour photography (in monochrome photography colour filters are more effective), and can saturate the image more by eliminating unwanted reflections. A cross screen filter , also known as a star filter , creates a star pattern, in which lines radiate outward from bright objects. The star pattern is generated by a very fine diffraction grating embedded in the filter, or sometimes by the use of prisms in the filter. The number of stars varies by the construction of the filter, as does the number of points each star has. 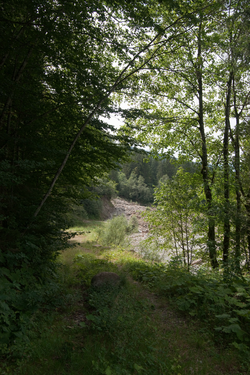 A diffusion filter (also called a softening filter ) softens subjects and generates a dreamy haze ( see photon diffusion ). This is most often used for portraits. It also has the effect of reducing contrast, and the filters are designed, labeled, sold, and used for that purpose too. There are many ways of accomplishing this effect, and thus filters from different manufacturers vary significantly. The two primary approaches are to use some form of grid or netting in the filter, or to use something which is transparent but not optically sharp. While these are not technically filters but accessory lenses , they are sold by filter manufacturers as part of their product lines, using the same holders and attachment systems. A close-up lens is a single or two-element converging lens used for close-up and macro photography , and works in the same way as spectacles used for reading. 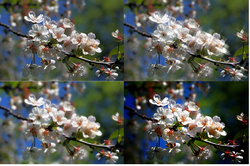 The insertion of a converging lens in front of the taking lens reduces the focal length of the combination. Close-up lenses are usually specified by their optical power, the reciprocal of the focal length in meters. Several close-up lenses may be used in combination; the optical power of the combination is the sum of the optical powers of the component lenses; a set of lenses of +1, +2, and +4 diopters can be combined to provide a range from +1 to +7 in steps of one. Photo filters are commonly made from glass , resin plastics similar to those used for eyeglasses (such as CR-39 ), polyester and polycarbonate ; sometimes acetate is used. Historically, filters were often made from gelatin , and color gels . While some filters are still described as gelatin or gel filters, they are no longer actually made from gelatin but from one of the plastics mentioned above. Certain kinds of filters use other materials inside a glass sandwich; for example, often use various special films, netting filters have nylon netting, and so forth. The filter diameter for a particular lens is commonly identified on the lens face by the ⌀ symbol. For example, a lens marking may indicate: “⌀55mm” or “55⌀” meaning it would accept a 55mm filter or lens hood . For square filters, 2" × 2", 3" × 3" and 4" × 4" were historically very common and are still made by some manufacturers. 100 mm × 100 mm is very close to 4" × 4", allowing use of many of the same holders, and is one of the more popular sizes currently (2006) in use; it is virtually a standard in the motion picture industry. 75 mm x 75 mm is very close to 3" × 3" and while less common today, was much in vogue in the 1990s. The French manufacturer Cokin makes a wide range of filters and holders in three sizes which is collectively known as the Cokin System . "A" (amateur) size is 67 mm wide, “P” (professional) size is 84 mm wide, and “X Pro” is 130 mm wide. Many other manufacturers make filters to fit Cokin holders. Cokin also makes a filter holder for 100 mm filters, which they call the “Z” size. Most of Cokin's filters are made of optical resins such as CR-39. A few round filter elements may be attached to the square/rectangular filter holders, usually polarizers and gradient filters which both need to be rotated and are more expensive to manufacture. Cokin formerly (1980s through mid-1990s) had competition from Hoya's Hoyarex system (75 mm x 75 mm filters mostly made from resin) and also a range made by Ambico, but both have withdrawn from the market. A small (84 mm) “system” range is still made (as of 2012) by Formatt Hitech. In general, square (and sometimes rectangular) filters from one system could be used in another system’s holders if the size was correct, but each made a different system of filter holder which could not be used together. Lee, Tiffen, Formatt Hitech and Singh Ray also make square / rectangular filters in the 100 × 100 and Cokin “P” sizes. Gel filters are very common in square form, rarely being used in circular form. These are thin flexible sheets of gelatin or plastic which must be held in rigid frames to prevent them from sagging. Gels are made not only for use as photo filters, but also in a wide range of colors for use in lighting applications, particularly for theatrical lighting. Gel holders are available from all of the square “system” makers, but are additionally provided by many camera manufacturers, by manufacturers of gel filters, and by makers of expensive professional camera accessories (particularly those manufacturers which target the movie and television camera markets. Graduated filters of a given width (67 mm, 84 mm, 100 mm, etc.) are often made oblong, rather than square, in order to allow the position of the gradation to be moved up or down in the picture. This allows, for example, the red part of a sunset filter to be placed at the horizon. These are used with the "system" holders described above. Certain manufacturers, most notably Rollei and Hasselblad , have created their own systems of bayonet mount for filters. Each design comes in several sizes, such as Bay I through Bay VIII for Rollei, and Bay 50 through Bay 104 for Hasselblad. The bottom left image has a diffusion filter applied to the original image (shown in the top left). The top right is a cross screen effect. All information for Photographic filter's wiki comes from the below links. Any source is valid, including Twitter, Facebook, Instagram, and LinkedIn. Pictures, videos, biodata, and files relating to Photographic filter are also acceptable encyclopedic sources. "Sony FDR-AX100 review - Hands on with first consumer 4K camcorder"
"Protection & UV Absorbing Filters"
"Photoshop Technique: Remove Purple Fringing"
"Canon EF 16-35mm f/2.8L II USM Instruction Manual"
"Canon EF 17-40mm f/4L USM Instruction Manual"
"Canon EF 50mm f/1.2L USM Instruction Manual"
"UV filters test - Tiffen 72mm UV"
"New B+W XS-Pro Digital Filters"
Other wiki pages related to Photographic filter.